first i wish to express my sincere thanks to your Isaipayanam trust to conduct free live-in-concert by you and your sister. I one among the thousands who attended the divas for ever by your sister and enjoyed the songs including the Hindi numbers.The way by which the programme was organised and presented the urge to"padidalame" everything was good. The research,collection and the rendering of pictures and the comments reminded me of a musical workshop.Your efforts to resurrect those memorable melodies are commendable.I sincerely thank your father for such an upbringing. Thanks and hope to meet in another classic. 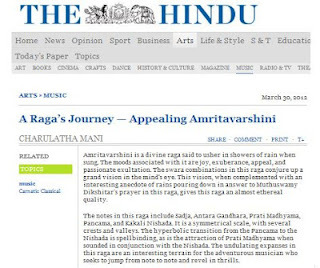 I am big fan of your voice and your contribution to the carnatic music world. hats off and God will be there to bless you with lof of health and wealth. if you are visiing USA, please let us know we can arrange a program in Michigan Tamil Sangam. take care. 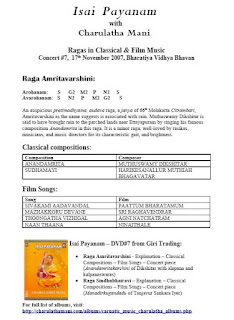 My elder son is studying Carnatic music from Padma Sundar at Troy Michigan USA. Prashanth is a big fan ofyou and he is the one introduce to me your "Isai Payanam" program. I use to watch this every day in youtube atleast once.. even a person like me without much carnatic experience are able to enjoy the music with your help. take care.